Cataracts are the leading cause of vision loss in people age 55 and older. Symptoms include blurry vision, problems reading, sensitivity to sunlight or car headlights and difficulty driving at night. But cataracts don’t have to rob you of a life worth seeing. A cataract procedure, performed by one of our board-certified doctors, can mean more than just improving your quality of vision — it becomes a unique opportunity to change the way you see for the rest of your life. What is a Cataract? What are the Symptoms? A cataract is a clouding of the naturally clear lens inside the eye. It is progressive and gradual. Cataracts are very common and the leading cause of visual loss in adults age 55 and older. Worldwide, they are the leading cause of reversible blindness. Over time, you may have noticed that your vision has become blurry. Patients with cataracts also often complain of increased difficulty seeing at night due to glare or light sensitivity. Simple everyday tasks such as driving can be affected. Beyond the safety issues, cataracts rob people of the little things that make life wonderful — like seeing and playing with grandchildren or watching movies or reading or enjoying any number of life’s little treasures. But it doesn’t have to be that way. If you think that you might have a cataract or you’ve been told that you already have one, a careful exam by one of our specialists is the first step. Our doctors use very specialized equipment — and years of training and experience — to examine your eyes and check for the presence of cataracts. If you do have symptomatic cataracts, your doctor will personally sit and discuss with you the health of your eyes, how your cataracts are affecting your vision, and what treatment options are available. 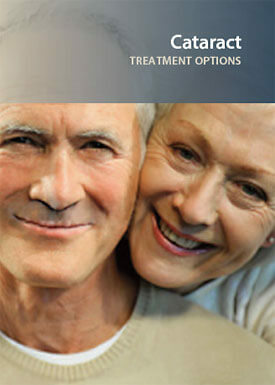 Cataract Surgery is one of the most successful and safest procedures performed in the world. In fact, more than 3 million are performed each year in the United States. It is a quick outpatient procedure that we perform in one of our several state-of-the-art surgical suites. Patients often resume their normal daily activities the next day. Based on your vision and examination, your doctor may recommend removing the cataract and replacing it with a clear lens implant. The procedure is painless and precise. Your surgeon will remove the cataract through a tiny incision so small that it will seal without even needing a stitch. Once the cataract has been removed, your doctor will place a new, clear lens in the eye to restore sharper vision. If you are interested in decreasing your dependence on distance and/or reading glasses, ask your doctor about our Hi-Tech Lens options. These lenses have advanced optics that focus in ways that standard implantable lenses cannot. The result can often be excellent vision without the need for spectacles. If you are a good candidate, your doctor will discuss this option with you. A Multifocal or Pseudo-Accommodating Lens can provide excellent, clear vision after cataract surgery at a variety of distances — often eliminating the need for distance or reading glasses. These lenses address the issue of presbyopia or “the need for reading glasses” by utilizing advanced optical properties that can focus light for distances near and far. A Toric Lens corrects astigmatism and can help patients who have worn glasses their whole life see much clearer in the distance — often without the aid of glasses. Your cataract surgeon will personally review these options with you, so that you can make the best decision for your eyes. In a study of Medicare beneficiaries, those who had cataracts surgically removed were less likely to take a serious fall, experiencing 16 percent fewer hip fractures in the year after the operation. Our cataract surgeons utilize the latest technology and enjoy an excellent reputation — one of high patient satisfaction and outstanding results. From the first moment a friendly staff member greets you until your surgery is performed in one of our state-of-the-art surgical suites, you’ll receive the compassionate care and personal attention that you deserve. Make your appointment to meet one of our cataract specialists and discover how we can make your world a brighter, clearer place.